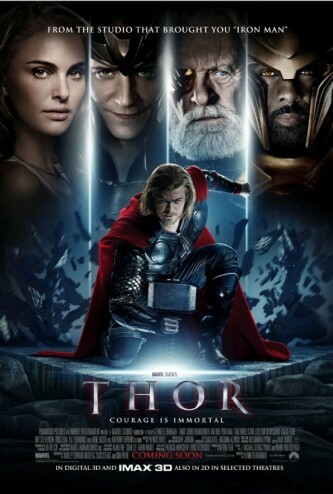 Yes, despite the fact that it came out last year, I’m reviewing Thor. There is, however, method to my madness. You see, I didn’t watch the big screen adaptation of Marvel Comics’ Norse Avenger until Tuesday night. Why did I put off seeing this movie for so long? Because everybody and their cousin told me that it was a barely passable snore fest. Phrases like, “Utterly unremarkable” and “Not as good as Iron Man” were tossed around with reckless abandon. 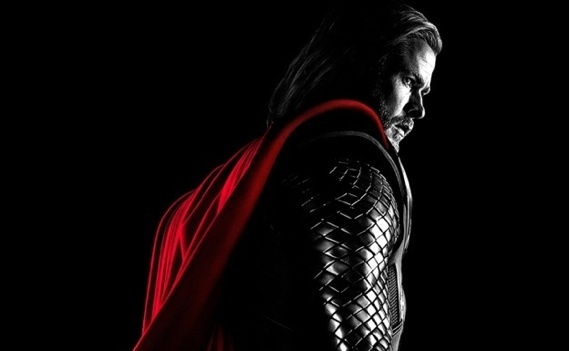 To which I now say, Thor might not be better than Iron Man, but it is certainly on par. Let’s begin with the abridged version of my well worn diatribe on how “the viewing public” have no stomach for anything remotely cosmic in their super hero movies. What do you know, that’s basically it right there. So long as a super hero movie is set on Earth, people will line up in droves to go see it (Spider-Man 3 as witness for the prosecution). Once things get cosmic, suspension of disbelief must start to break down. Go ahead and look up “The Dark Phoenix Saga”, and then tell me just how much it has in common with X-Men 3. Or see if Doctor Doom had any role to play in Galactus/Silver Surfer’s first encounter with humanity. I digress. Marvel made a gutsy decision to keep Thor true to his Asgardian roots, or at least close enough that nothing seemed out of place to my eyes. Despite opting for the fantastic, rather than the familiar, Thor, Sif, and the Warriors Three jaunt between Earth, Asgard (Thor’s stomping grounds, just like in the mythology), and Jotunheim (the realm of the Frost Giants) with the same sort of narrative ease that would see Tony Stark putting on Armani suit. This smooth introduction into an alien world, albeit one that should be vaguely familiar to anybody who completed the seventh grade, is likely due to the fact that unlike Iron Man, Captain America, and The Incredible Hulk, Thor breaks the “back story before real adventure” formula of Marvel’s “Avenger Initiative”. There’s no need to burn forty minutes establishing suitable hand waving for Thor’s powers; he’s the son of Odin and he’s got a magic hammer. What else do you need to know? Sure, the Asgardians fought a war with the Frost Giants of Jotunheim. But the key difference between this movie and some of the aforementioned is that Odin’s flashbacks frame the film’s conflict, rather than its central character’s abilities. This allows the story to unfold at a more natural pace, that is to say without the use of an action sequence montage; I’m looking at you, Captain America. That’s fine, Adam, but it’s still not better than Iron Man. Fine, it might not be better, but it’s hard to say the movie is worse when the exact same conceits drive both stories. Tony Stark is a prideful, vainglorious, prince who thinks that war is great and glorious until he gets dragged out of Stark Tower to witness human suffering at an individual level. The character undergoes a metamorphosis and is reborn as the heroic Iron Man, having paid in blood for his past hubris. Thor is a narcissistic warmonger who thinks that his father is weak for not destroying the Frost Giants. Therein Thor is stripped of his powers and banished to Earth. Upon arrival he learns a lesson in humility, responsibility, and self-sacrifice before finding redemption and rebirth. Oh and both movies feature family squabbles spilling into high stakes situations in the finest fashion of Hamlet. I might even be inclined to liken Loki to Iago as a character whose motivations are a bit more complex than, “Behold, I am evil. Watch me do evil things.” But I’ll save that for another time. Thor and Iron Man are almost identical given the way in which their protagonists follow the heroic cycle. With all things being generally equal in terms of story, acting, and visual effects – RDJ edges out Chris Hemsworth as a leading man but Thor beats out Iron Man’s aesthetic – it seems rather silly to talk about Thor’s deficiencies compared to Iron Man. The two films, as well as the two characters, compare quite nicely. For anybody else bought into the anti-Thor pro-Iron Man agenda, you’re missing out on a good super hero movie. It’s not the best thing ever with an extra serving of bacon, but it’s genuinely entertaining on all counts. Also, no SHIELD jokes from Agent Phil Coulson. Yay! Second Person Narratives: I’m not your monster.